ABILENE, KAN. (April 6, 2015) – When it’s fair and rodeo week in Abilene, there won’t be just spur-wearin’, bull-ridin’, steer wrestlin’ cowboys in town. There will also be another set of cowboys who are talented with rhyme and meter. The 18th annual National Cowboy Poetry Rodeo (NCPR) will take place in Abilene July 30-August 1, during the Wild Bill Hickok Rodeo and Central Kansas Free Fair. This event is the only cowboy poetry rodeo competition of its kind, and has been naming cowboy poet champions since it began in 1998. It’s very fitting that the National Cowboy Poetry Rodeo be held in Abilene, said organizer Geff Dawson. He acquired the rights to produce the Poetry Rodeo from Sam Jackson, founder of the event. “I decided there’s not a better place to have a national cowboy poetry competition than the town I grew up in, the original Cowtown, which is Abilene, Kansas,” he said. The format of the Poetry Rodeo consists of two levels of competition, the Rising Stars, those people who have never won at the NCPR before, and the Silver Buckle Division, those who have won before. There are two categories of poetry: serious and humorous. Entrants draw for their position and recite their best poetry. They are judged on their stage presence, material, how they entertain, and their rhythm and meter. Five judges turn in their scores, and after each competitor, their score cards are turned in with the highest and lowest scores being thrown out and the remaining three scores averaged. After the first day of competition, half of the competitors are eliminated. On the second day, there is a second go-round, with the same judging strategy, and winners are chosen over the average of their two-day score. The judges’ panel has been determined, and it includes some “pretty famous” people, Dawson said. Sam Jackson, founder of the event, will judge, as will Jay Snyder, a nationally-known cowboy poet from Oklahoma, and Kyle Bauer, general manager of KFRM Radio. The Chief Justice of the Kansas Supreme Court, Lawton Nuss, will also judge. Nuss “is a fan of cowboy and cowgirl poets,” Dawson said, and he has judged the Kansas Cowboy Poetry Competition in the past. Ed Nesselhuf, a former champion of NCPR, will serve as judge foreman. Dawson said past competitions attracted more than seventy entries, and he is hoping for the same this year. Poets may enter more than one category. June 1 is the deadline for entries but Dawson may extend the deadline if necessary. Dawson himself is a cowboy poet. The Abilene, Kan. man began writing cowboy poetry in 2003, after his wife urged him to write down the stories he told her at the end of the days’ activities. He entered the National Cowboy Poetry Rodeo in 2005 and won several second place honors, with the goal of returning the next year. “I was so impressed with the contest, I told my wife, I’m going back next year and I’m going to win that thing. For a year, I practiced and polished and practiced and polished,” and in 2006, he won the National Cowboy Poetry Rodeo’s Best of the Best. “And it changed my life,” he said. He still is a ranch cowboy, but he performs his cowboy poetry all over the nation, from Silver Dollar City in Branson, Mo. to opening for Michael Martin Murphy and Rex Allen, Jr. 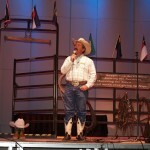 He is an inductee into the Kansas Cowboy Hall of Fame as an entertainer. Dawson has planned Poetry Rodeo activities so entrants and spectators can attend evening rodeo performances at the Wild Bill Hickok Rodeo. The Poetry Rodeo is free to the public; a venue has not been determined yet. 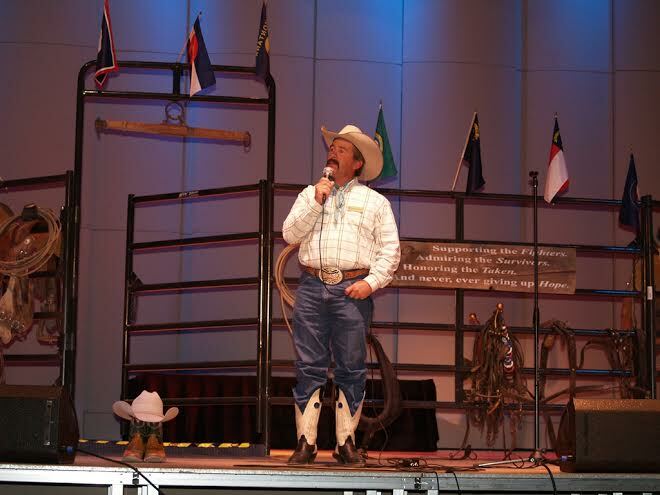 For more information on the National Cowboy Poetry Rodeo, visit the website at NCPR.us or find them on Facebook at Facebook.com/nationalcowboypoetryrodeo. For more information on the PRCA rodeo, visit the website at WildBillHickokRodeo.com or call the fair office at 785.263.4570. Gold sponsor of the NCPR is John and Mary McDonald of Rawhide Portable Corrals.